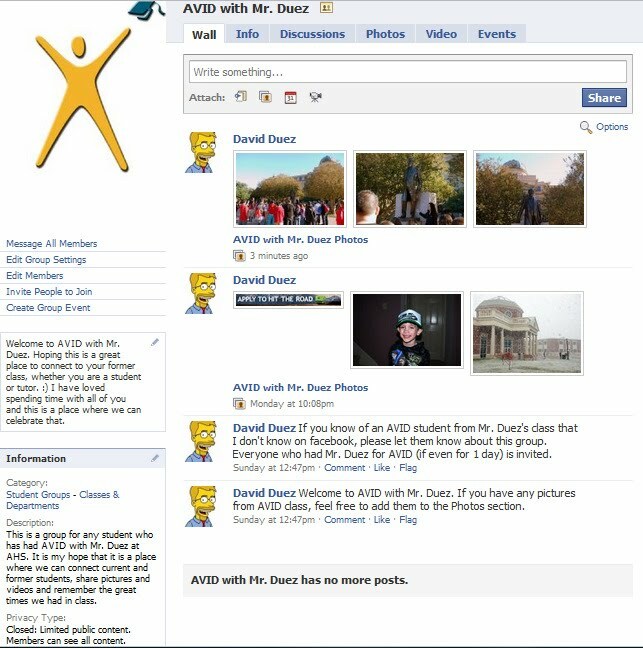 I created a Facebook group for any AVID students who have had Mr. Duez in class. It is my hope that we can share some pictures, video and memories here. It is a closed group, so nothing that is posted here can be seen by anyone who is not a group member. I can add new members and they can request to be added by going to the link below. I can envision this being a wonderful place for graduated AVID students to keep in contact with what is happening in my AVID class. It will be a wonderful place to remember the good times we had in AVID. ANY person who spent even a day in my AVID class is invited. Also, thank you for all of the great comments you leave on my blog posts. I always enjoy reading them. Only one more month until school starts for us. Ahhhhhhhh!